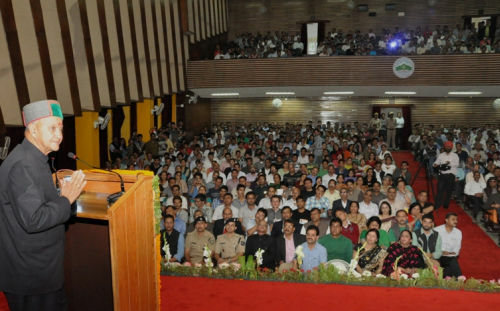 Chief Minister Virbhadra Singh said that in an egalitarian society the role of education institutions was to train young minds in such a way that they were able to develop their potential and fully participate in the process of the national growth. He said that Universities must produce learned persons who could understand the complex connection between education institutions and the present day society. Virbhadra Singh said this while presiding over the closing ceremony of three days 44th Foundation Day Celebrations at Himachal Pradesh University (HPU) here today. He said that unless education keeps abreast of the social, economic and political changes of the present epoch, it ceases to have meaning and cannot provide salvation envisaged by Father of Nation Mahatma Gandhi. Chief Minister said that the HPU had recently introduced Choice Based Credit System (CBCS) at the undergraduate level to counter what is called the ‘compartmentalized’ or ‘cubicalized’ education to use Professor Yashpaul’s term’. It would go a long a way in assuring greater employability of our students across the World, he added. Virbhadra Singh said that 44 years were indeed a long journey for any institution and it was a matter of pride and happiness that this University had achieved many milestones in the fields of research, teaching and innovation and many of its alumni have attained places of prominence. He said that someone had rightly pointed out that a University by its very name professes to teach universal knowledge and it was well known that knowledge was power. In fact it is not just power but as Mahatma Gandhi rightly pointed out, ‘It ultimately gives salvation’, he said. Chief Minister said that in the present times, education was not a luxury permitting the elite groups advantage over others but had become a necessity without which a person was defenseless in this complex world. He said that in the challenging time of today there was an enormous responsibility that academic community has to shoulder. Virbhadra Singh said that women education was the index of any nations’ growth as education not only works towards women’s well-being but also for their empowerment and when women are educated, they become active agents of change. He said that as a result of impetus given to the education of girls in the State, they were excelling in every field. He said that provision had bee made to provide free education to the girls during his tenure in the State many years back. He said that it was good to note that meritorious girls outshined the boys in recent held convocation function of HPU presided over by the President of India. Chief Minister said that though we had achieved a lot in the education sector but still lot more remains to be done. He stressed that the backward and remote areas must have a greater access to higher education thus efforts should be made to make higher education more accessible and affordable. He said that it was noteworthy that the literacy rate of our State was highest in the country and we have strived hard to provide education reach and benefits to the downtrodden sections of the society. Virbhadra Singh said that conventional classroom was facing many challenges and it was struggling for survival against the highly persuasive virtual world created by the technology. He said that the time therefore, had come to shift education from instruction and knowledge to discovery. He said that real education continues all our lives based on our experiences and the environment we live in. Chief Minister exhorted the students to make full use of their time and opportunity being provided to them and strive hard to achieve their aims. He said that aim of education should be to convert human mind into a spring that spreads its brilliance all around. Virbhadra Singh ended up with the inspiring words of Swami Vivekananda-“Stand up, be bold, be strong. Take the whole responsibility on your own shoulders, and know that you are the creator of your own destiny”. Earlier, Chief Minister laid the foundation stone of third phase of University Information Technology (UIT) four storied building to be constructed at a cost of Rs. 4.20 crores at HPU campus. Vice Chancellor HPU Professor A.D.N. 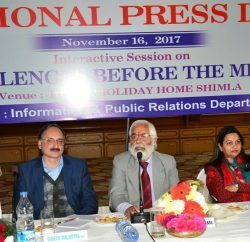 Bajpai in his welcome speech said that HPU had pioneered in implementing Rastriya Uchhtar Shiksha Abhiyan (RUSA) thus making Himachal Pradesh a lead State in the Country. He said that it was an important step towards providing quality education. He said that it was a matter of pride that HPU had improved its ranking from 44th to 32nd in top 50 Universities of the Country as per India Today survey. Prof. Bajpai said, “We want to make HPU world class University as our Professors are best in the country”. He said that 107 bigha land had been identified to make additional campus at Ghanahatti. 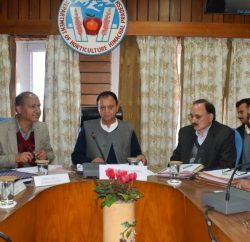 He said that HPU campus at Dharmshala was already functional and efforts were being made to develop two new campuses of HPU at Mandi and Una to facilitate the students to get quality higher education nearer to their place. Chief Parliamentary Secretary (Education) Neeraj Bharti, CPS Inder Dutt Lakhanpal, Member Executive Council Chandershekhar, Dean of Studies Dr. Suresh Kumar, Registrar Prof. Mohan Jharta, DC Shimla, Dinesh Malhotra, SP Abhishek Dullar, Professors and students of HPU were present among others.